I’ve been spending some time in the capital city of Kenya, Nairobi. Nairobi gets its name from the Masai phrase Enkare Nyrobi which means cool water. It perhaps was names so as its got the Nairobi River flowing through it. However, the river is no longer what I remembered it as. Its polluted and the flow has reduced due modernization. I was born and brought up in Nairobi but have been living in Mombasa for the past 35 years. Usually when hubby and I are traveling abroad, we do not bother to come into the city and prefer to catch our connecting flight. The traffic in Nairobi is a nightmare in spite of all the new highways and numerous inner roads. The new roads are not able to cope with the ever increasing number of cars on on the road. During this stay in Nairobi, we’ve been visiting several malls and other places of interests and I must admit though I’ve grown up here and have in previous years driven myself around, I’d now get lost if I had to drive. Nairobi over the years has grown by leaps and bounds. Whenever you choose to stay you will have access to a mega or a reasonably good sized mall. Chains like Carrefour have opened up in several malls, availability of goods, be it food, clothes, gifts, electronics, etc is stupendous. Locally crafted items have become better in quality and more artisans are ready to experiments and create new souvenirs and gift items. Eating scene in Nairobi has changed drastically with so many different kinds of cuisines available. However all this makes my heart feel really sad. Its not that I’m not happy that the progress that Kenya is making, however what makes me feel jealous, yes jealous is the fact that the rest of Kenya has forgotten that Mombasa exists. Whereas Nairobi and the surrounding towns and areas are improving, Mombasa is on the downslide at a rapid pace. Roads, rubbish collection, availability of goods, business opportunities are practically non existent. But we can only hope and pray that some development will be diverted to the coast. Coming to today’s recipe, its after quite a while that I’m taking part in the Fantastical Food Fight. The theme for the month of March, chosen by Sarah is Carrot Cake. For this theme we could make carrot cake or use the carrot cake flavors to make something different. As I’m into smoothies for breakfast these days, I opted to prepare a smoothie. I make it a point to have some turmeric powder everyday either in my smoothie or in hot water with lemon and honey. 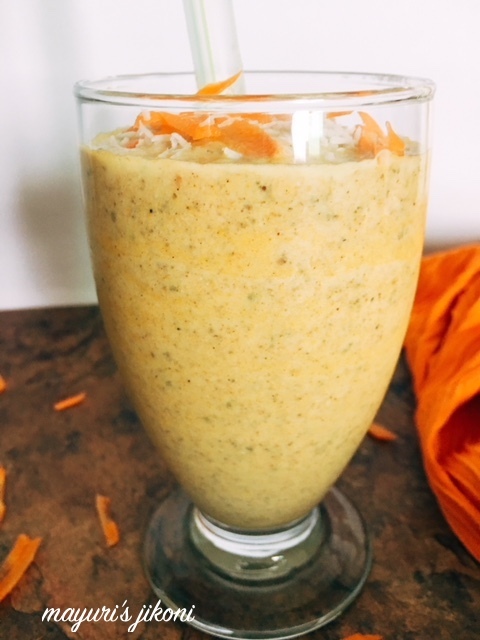 I made the carrot cake and turmeric smoothie for the first time and loved the flavors. It tastes just like a carrot cake but without all the sugar. I added oatmeal to give it a cake like taste. I’ve added a bit more of ginger powder as I love the taste of it. Adjust the amount of spices according to your taste. What’s missing in the smoothie are some raisins, which I totally forgot to add. This smoothie was definitely so different in taste from my usual smoothie of banana and any other fruit. It was really filling as I didn’t need a snack during mid morning. If Sarah would not have suggested this theme, I would not have bothered to prepare this smoothie as I usually don’t associate carrots with breakfast. However, this is one smoothie that one can enjoy for lunch, as a tummy filler in between meals or even as a light dinner option. Peel and cut the carrot into slices or cubes. Steam it till it becomes soft. Add all the ingredients for the smoothie, including the steamed carrot into a blender and process it till its smooth. Pour into a serving glass and leave it in the fridge to chill for 20-25 minutes. Sprinkle some grated carrot and coconut on top and enjoy. Next time I’d probably add more carrots. I added ½ tsp ginger powder as I love the taste of ginger. You can reduce the amount. I added turmeric powder to get the colour and also as I try and include turmeric in my smoothies or lemon water every morning. I added only 1 tbsp honey, but feel free to add any sweetener of your choice. Add greek yogurt or cream cheese instead of cottage cheese. Mayuri, it’s something new and different.. looks really yummy.. This sounds quite nice – I like trying to find ways to get the turmeric in! I'm sorry that the Nairobi of your memory is getting lost. That seems to be happening everywhere, and I'm not always sure that 'modernization' is worth what's lost. What a fun take on carrot cake! Thanks for sharing. This looks delicious and nutritious. Thanks for sharing what's going on in Kenya too. 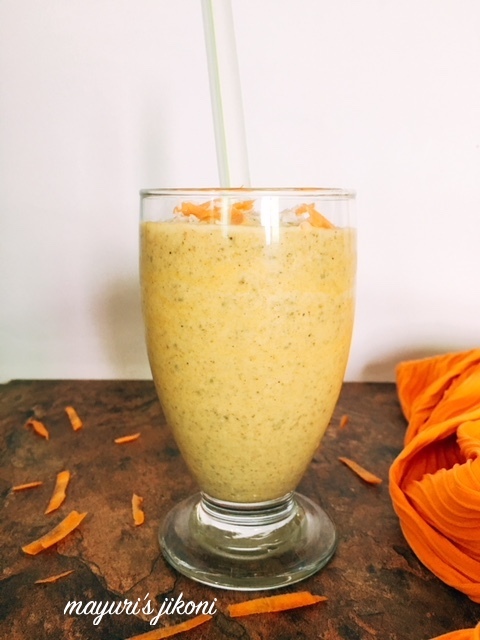 What a great idea to make a carrot cake smoothie! It is always the case that cities with political clout get all the attention and thrive, at least initially. But things do change slowly, as I have seen in India. The very development that is celebrated now will also be the cause of the downfall. Bangalore being a case in point. A drinkable piece of my favorite cake!! Brilliant! The smoothie looks absolutely stunning! I am always intrigued to hear stories from other countries and really enjoyed your bit on Kenya in this post. Modernization definitely has its pros and cons (the pollution and traffic but availability of goods). It's always a bit of a culture shock for me when I visit home in Minnesota because it's all farmland and very small towns, whereas I live in a large city in East Tennessee now. For example, I have 4 or 5 McDonald's within a 5 mile radius, but in Minnesota, it was 1 and it was 20 miles away. We didn't have a mall where I grew up, but there are two large ones in my current city and tons of mini shopping malls. But where I grew up, it was relatively safe and peaceful – definitely less polluted and populated. Here in my city, the diversity of ethnicities and culture is widespread and incredible. I am sure the smoothie must be nice and filling too. Perfect one for kids. Never thought of making smoothie with carrot cake, seriously very interesting to finish leftover cakes as smoothie, my kids will definitely love this smoothie. Smoothie and carrot cake both together? Now I can have my cake and eat it too 🙂 Such a lovely creation of yours mayuri. Sounds so yummy. This is really such a healthy smoothie..Carrot cake with turmeric and ginger sounds so interesting !! Carrot cake smoothie sounds delicious and different. I will try this smoothie as I am going to start having only smoothies for breakfast. I love how these themes bring out the best in our creativity. Else, we are stuck doing the usual, isn't it? 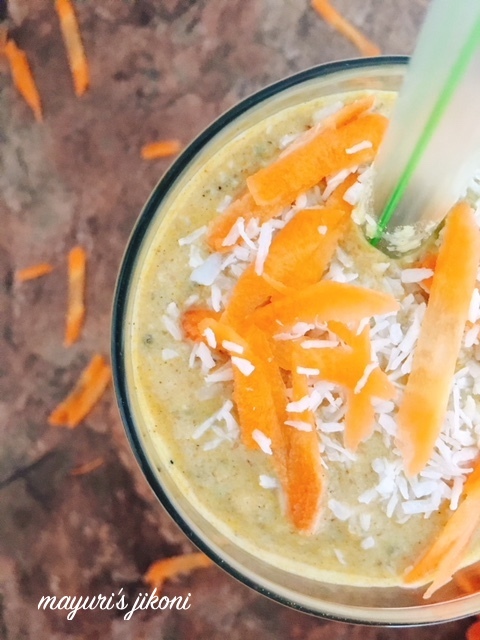 Such things shake us up and the end result is fascinating, just like this smoothie. Great flavours, good dose of health and each sip makes you realise you are gorging on a carrot cake! Stunning smoothie. This is completely new to me.. Sounds interesting and yummy ! Superb. Very much new to try. Wonderful recipe. Oh yum!It would be lovely to sip my carrot cake from a glass. I love how you have created a similar flavour profile using cottage cheese, oats, cinnamon and nutmeg. Filling smoothie for a quick breakfast.. Very interesting recipe for a hot day to quit cooking for a long in front of fire.. I have seen this smoothie on so many blogs but never tried it. It looks so filling and very inviting too. Wow Sommothie with cake.. Sounds yumm.. It is perfect for breakfast .. This quite interesting smoothie. I never had a smoothie with oats and cheese. Looks simple and delicious. Mayuri, Such a fabulous rendering to the place you have loved and super cool recipe. Have to try this as soon as i get back my blender. I am sure the smoothie must be tasting superb with all those ingredients in it. Love that colour of it. Wow that is a delicious innovation. Love the idea of the smoothie with the carrot cake ingredients.